Today is actually Friday the 13th but I am no Freddie Kruger. OK, maybe on Monday mornings. Think about the times that you are “monstrous”. I have been one at many times. Don’t be bugging me in my kitchen….I have to stay happy in the kitchen so the happiness goes out to all I feed. I don’t want to be that screaming witch pitchin’ a fit ‘cuz someone used up all the milk for the scalloped potatoes. I have been the Cookie Monster. I now buy those wonderful chocolate coated Dads rings. Norm and the foraging daughters like them, me, not so much. But God help them if they touch my Red Barn smoked cheese! I go all Freddie on them! Have you ever been so hungry or tired that you aren’t yourself? It is like Dr. Frankenstein stitched together all the “shoulds” and created the monster that should exercise, diet, like itself and obey. These are the Dr. Phils, Oz’s and Bernstiens etc and not a reflection on the “good” doctors supporting my journey to health. I think there is something in all of us that wants to have the freedom most monsters have but not so much of the death and destruction. But If I was to pick a monster to be for Friday the 13th, I would pick Selene, the Kate Beckinsale character in Underworld. Are vampires monsters? How come you don’t see any obese vampires? I can do the pale thing! Maybe vampirism is a good weight loss regime. ~ by 1fatgirlshrinking - Diane Kirby on January 13, 2012. If I were a monster I think I’d be a muppet. Or maybe Max from Where the Wild Things Are. 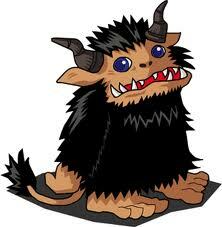 Or maybe that gentle bumbling monster Ludo from Jim Henson’s The Labyrinth. Or perhaps the Luck Dragon from Neverending Story. In any case, I could eat whatever I wanted and everyone would love me because I’d be sooooooo cuddly! I definitely have a snarky monster inside who comes out when my blood sugar hits the basement. Oh boy, that is NOT a pretty picture! Although sometimes that monster isn’t snarky at all. She’s weepy, squirrelly, sleepy and just a little bit dumb. Anyone have some cheese handy? Preferably smoked cheddar? But Max was a child dressed up. I will grant you that Sweetums or Animal would work…maybe Gonzo. For me that is!